Image, top: Detail of Jordan’s Madaba Mosaic (ca. 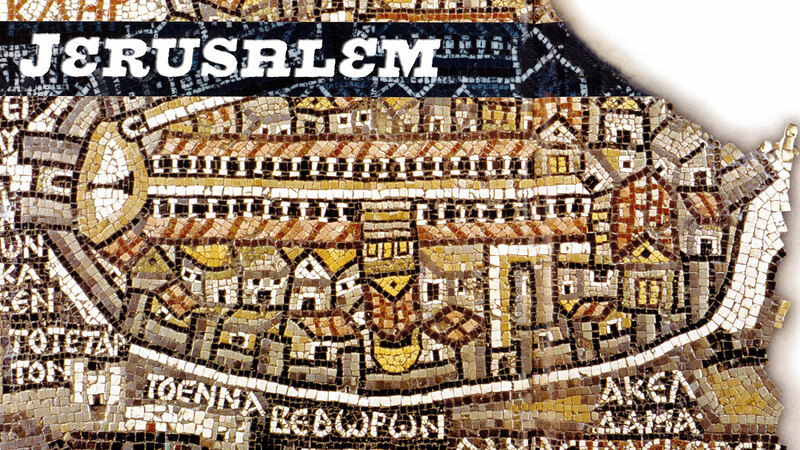 sixth century), emphasizing Jerusalem as the center of the Holy Land. Bernard Wasserstein is currently Ulrich E. and Harriet Meyer Professor of modern European Jewish history at the University of Chicago. Born in London and educated at Oxford and at the Hebrew University of Jerusalem, he has been president of the Jewish Historical Society of England and a contributor to the Encyclopaedia Britannica. His books have been translated into French, German, Dutch, Hebrew, Arabic, Romanian and Chinese. His latest book is Israelis and Palestinians: Why Do They Fight? Can They Stop? Vision publisher David Hulme interviewed Wasserstein in Glasgow in 2002. DH When did the idea of Jerusalem as a capital city emerge in modern history? BW It hadn’t been a capital from the Roman destruction of Herod’s city in A.D. 70 until 1917, when it became the capital of Mandatory Palestine under the British. That period lasted until 1948. But from 70 until 1917 it was a provincial center, or a provincial capital, but not the capital of an independent state. Of course, Mandatory Palestine was not an independent state either. It was a British colony by another name. So it was only in 1948 that Jerusalem became the capital of an independent state. The eastern part of the city was captured by Israel as a result of the 1967 Arab-Israeli war. Israel took whatever measures it could to try to enhance its control over Jerusalem, reemphasizing the city’s role as its capital. And it has been trying to do so ever since. This has not, however, persuaded the rest of the world that Jerusalem is the capital of Israel, at least in diplomatic terms—although in practical terms, that is what Jerusalem now is. DH Why did the early Zionists avoid establishing Jerusalem as a center? BW There were a number of reasons for that. First of all, the early Zionists had an ideology of turning the socioeconomic pyramid of Jewish life upside down. We might call it an antiurban ideology. Jerusalem, the largest center of Jewish urban settlement in Palestine at the time—more than half the Jews in Palestine at the end of the 19th century lived in Jerusalem—was therefore, in a sense, the enemy. It was also the enemy because the great majority of the Jews who lived in Jerusalem were religious anti-Zionists. They did not sympathize with the ideology and goals of the Zionist agricultural pioneers, who saw themselves as a new broom that would sweep away the accumulated debris of the Jewish past, including the existing Jewish population in Jerusalem. So they had very little time for the Jews in Jerusalem, and vice versa. DH Didn’t Zionist founder Theodor Herzl have this view when he first went there? In his diary he says it’s a filthy, smelly place and he doesn’t seem to relate to it in the way one might suppose. BW Nearly all the visitors to Jerusalem in the 19th century—all the European visitors who recorded their impressions—were pretty horrified by what they saw. If you look not only at Theodor Herzl’s impressions but at the impressions of Mark Twain, or of Alexander Kinglake, one of the great travel writers of the 19th century, they all write about Jerusalem as a pretty smelly and disappointingly unspiritual site. That’s true also of the second great leader of Zionism, Chaim Weizmann, when he visited Palestine in the early years of the 20th century. He similarly came away horrified. He writes letters to his wife, Vera, in which he expresses nothing but disgust for the Jews of Jerusalem and for the squalor in which they live. Jerusalem in those days was a rather unimpressive place. DH How did we get from the anti-Jerusalem position among early Zionists to the city’s status today as modern Israel’s “eternal and undivided capital,” which seems to many people to create an intractable situation? BW Well, first of all let’s remember that Zionism is about Zion. Mount Zion is at the heart of Jerusalem. And very early on Zionism faced a dilemma as to whether it should focus on Palestine or on some other territory that might be more hospitable toward Jewish immigration. A critical decision on that subject was taken at the 1903 Zionist Congress, where a debate took place regarding a British government offer of territory in East Africa for Jewish settlement. At that congress and at a further congress the following year, the decision was made that the Zionist organization would not accept any territory other than Palestine. The Zionists did eventually establish their political headquarters in Jerusalem in the 1930s with the creation of the Jewish Agency. And it became more or less understood, although it was never really discussed at any great length, that Jerusalem would become the capital of the Jewish state. It began to be discussed in 1936 when the question of partition of Palestine came up. At that point the question was, should Jerusalem be part of the Jewish state or not? The Zionists, of course, had the ambition of incorporating as much of Palestine as possible within their state. So far as Jerusalem was concerned, they were in an advantageous position because the Jews were in the majority in the city. They had been since the late 19th century. However, the mayor was always a Muslim. This had been established under Ottoman rule. The first mayor of Jerusalem under the British was Muslim, so were the second and the third. But these mayors came under increasing pressure from the Jewish majority in the city, and the Jews began to demand that they should have their own mayor. From the very outset, the Zionists’ interest in Jerusalem was a matter of gradual growth rather than of a priori ideological insistence. They calculated that they would for the time being be better off accepting the idea of Jerusalem as an international city, with the hope that in due course, with its Jewish majority, it would become part of the Jewish state. DH Then how do you account for some secular Zionists’ almost religious devotion to the city? I think of Moshe Dayan in 1967 as the Israelis captured the Old City. To that point he was an atheist to all intents and purposes. But suddenly he sounded like a religious devotee. BW Moshe Dayan had been the head of the Israeli negotiating team that had been responsible in 1949, 1950 and 1951 for discussions with the Jordanian representatives over the status of Jerusalem, which resulted in virtual agreement on the division of the city. And indeed, there had been proposals made by Dayan on behalf of the Israeli government for small exchanges of territory. Israel would actually give up parts of West Jerusalem in return for other areas, in particular for access to the Israeli enclave on Mount Scopus, the area holding the Hebrew University and the Hadassah Hospital, which was an island of Jewish territory surrounded by the Arabs. I think 1967 was a kind of religious moment even for secular Jews. Zionism became a kind of secular religion for many Jews in the Diaspora, particularly in the period between 1967 and perhaps the early 1980s. They had shuffled off much of their religious devotion, but they were looking for some nonreligious form of connection to their heritage and found it in Zionism. And in the stones of the Western Wall—the very physical relics of Jewish history that were captured at that moment—they found a focus for that kind of secular religious devotion. DH It brings up the question of identity and ideology. Here are a people who have constantly said “Next year in Jerusalem,” who have repeated that phrase to themselves generation after generation. Even if they become secularized, the city retains a powerful image for them. Is there an ideological element that supports identity so that, once all the conditions are right, its importance comes back to the fore on a personal level? BW Well, the centrality of Jerusalem in Zionist ideology probably really dates only from 1967. There was very little demand in Israel or in the Jewish world between 1948 and 1967 for any campaign to liberate Jerusalem or for irredentist capture of the eastern part of the city. There were complaints, of course, about the Jordanian refusal to allow Jews to pray at the Western Wall or to visit the ancient Jewish cemetery on the Mount of Olives, as had been laid down in the Israeli-Jordanian armistice agreement in 1949. But these were part of the general grievances to do with the continuing state of war between the two countries. They weren’t really central to Zionist demands or thinking at that time. From June 1967 onward, Jerusalem became very central. And having captured the eastern part of the city, and particularly the Western Wall, the idea of giving it up became almost unthinkable to most Israelis until quite recently. DH After the ’67 war there was a debate about which territory should be given back. The by then retired David Ben Gurion advised his colleagues to return the West Bank but not East Jerusalem. Why did he draw the line there? BW I remember going to talk to Ben Gurion about this and other things in 1970. And he was very clear about that. He also made an exception of the Golan Heights. I think you have to bear in mind that, at that point, Israel had never had agreed borders, because it was in a state of war with all its neighbors and had been since the moment of its birth. So the idea that the armistice lines that Israel had had between 1949 and 1967 were sacrosanct was not part of Israeli thinking. The view was rather that Israel should negotiate the best deal that it could, that would make sense for itself in strategic terms and also in terms of having some peace arrangement if possible with its neighbors. Ben Gurion’s view was that the Golan Heights were essential for strategic reasons, and that Jerusalem was essential for, as it were, sentimental or ideological nationalist reasons. Since then the view that has been taken by Israeli strategic thinkers about the Golan Heights has changed. This is mainly because of changes in military technology, the new technology of rockets and so forth, which means that the Golan Heights don’t have necessarily the strategic role that they had in Israeli thinking. And as for Jerusalem, there has also been a change. We are talking about a generation later, and many Israelis, such as Barak, now take a different view on Jerusalem and do favor some different type of arrangement whereby Israel would make some significant concessions. They are certainly ideological descendants of Ben Gurion. DH When the Palestinian leaders talk about Jerusalem, what do they mean by it? BW Well, in the Palestinian political and social imagination, I think Jerusalem really only includes the Arab-inhabited areas of the city—at most, the Arab-inhabited areas and the areas that were once inhabited by Arabs. But West Jerusalem, which with the exception of some areas was always mainly Jewish, does not form part of what you might call the “terra irredenta” of the Palestinians (except insofar as Palestine as a whole forms that). What they are concerned about primarily is the area that was under Jordanian rule from 1949 to 1967—in particular the Old City and the Muslim and Christian Quarters; less so the Jewish and Armenian Quarters. DH Is an agreement between the two main contenders possible on Jerusalem? BW A draft agreement was already reached on October 31, 1995, between two senior accredited negotiators of the Israeli and Palestinian governments. It provided for essentially Arab control of Arab-inhabited areas and Jewish control of Jewish-inhabited areas. It wasn’t a complete agreement, but it remains on the table and it formed the basis of the proposals that were made by Barak with the effective approval of President Clinton at Camp David in the summer of 2000. My feeling is that that is going to be the basis of any agreement reached about Jerusalem, not because I happen to think it’s fair or sensible, but because it is the only agreement that brings the politics of Jerusalem into some form of harmony with its existing social geography. That is a fact that no amount of hot air about Jerusalem being more important to this religion or that religion can change. DH In your book Divided Jerusalem, you mention many foreign players who have made intrusions into Jerusalem’s politics and social life. There are still outside players. We have the so-called Quartet of the UN, the U.S., the E.U. and Russia. There’s also the Trio of Egypt, Jordan and Saudi Arabia. How important are all these other players to the resolution of the Jerusalem problem? BW Well, outsiders have always played a significant role in relation to Jerusalem. Jerusalem is, of course, an international city. It has a resonance for billions of people beyond itself—Muslims, Jews and Christians. And outsiders have, throughout recorded history, sought to determine the fate of the city. In recent years, the primary political determinants of its fate have been local actors, mainly Israelis, Palestinians and Jordanians. The efforts of outsiders to dictate the future of the city, or to determine it, or to affect it, have not been very effective. Muslims, Christians, the Soviet Union, the United States, Great Britain—they have all had a go, but none of them has really been able to exercise a determining influence. I think it’s a very healthy thing that the people or peoples of Jerusalem should be those who primarily determine its future. I don’t think that the Christian world, to be perfectly frank, has played a very constructive role in relation to Jerusalem in recent decades. One can make one’s own judgment—I suppose we all will—about the Muslim and Jewish worlds. But the Christian effort in 1947 to seize Jerusalem as it were by default, under the pretext of internationalization, didn’t work. And the main reason it didn’t work was that the local inhabitants (who were a great majority of its population; less than 20 percent of its population was Christian at that time) decided that they didn’t want Christian control in the form of so-called international rule. It’s quite clear that the Vatican has withdrawn now from its earlier position of seeking to perpetuate Christian control by means of the cloak of international rule. It has now accepted that its aims are limited to protection of the Christian holy places and of the rights of the few remaining Christian inhabitants of Jerusalem, now only a tiny percentage—less than 5 percent of the population. The European Union is unlikely, I think, to play any significant role in the question. At Camp David in 2000, at the final negotiations between the Israelis and the Palestinians, and at the subsequent discussions at Taba in December 2000 and January 2001, there were all sorts of ideas floating around about the Old City. For example, the so-called lateral division of sovereignty on the Temple Mount, whereby everything below the ground would be Israeli and everything above the ground would be Palestinian. According sovereignty to God was another idea that came up. It is a hard nut to crack. I believe that in the end the problem is soluble, even the issue of the Temple Mount and the holy places. This is where I think some attention to the history of the Jerusalem Question is helpful. It is soluble by recourse to the old principle on which most religious disputes in Jerusalem over the centuries have been quieted down—the principle of the status quo at the holy places. The notion that the Western Wall is a Muslim holy place is really quite recent in Muslim religious history. The Palestinian Authority has made it clear that it would in the last resort be ready to accept that the Western Wall and indeed the Jewish Quarter of the Old City should be a part of sovereign Israel. It is also a fact that, until June 1967, no demands for Jewish prayer rights on the Temple Mount were heard from any Jewish source that had any standing. This was something that began to be talked about only once the Jews captured it. It is also a fact that from June 1967 until this day, the Temple Mount has remained entirely under the control of the Muslim religious authorities. No synagogue has been established on it. And every Israeli government of the left and the right, including the present Israeli government of Ariel Sharon, has enforced a prohibition on Jewish prayer on the Temple Mount. In the end we are going to find that the principle of the status quo is the one that provides a path to a solution; namely, continuing Muslim control over what has been since the beginning of Muslim rule in Jerusalem a Muslim holy place and not a Jewish one. DH Are you optimistic about the resolution of the problem in the short term? BW Well, yes, I am. I believe that the Israelis and the Palestinians are on a long, twisting, tortuous and tortured path toward an accommodation. They have been on that path since 1993, with ups and downs, of course. We are at a terrible down point now, but considerable progress was made. The blueprint for a solution (which has more or less been worked out in the case of Jerusalem, as I stress) will receive the imprimatur of the political classes on both sides and of a majority of public opinion on both sides. No doubt there will be resistance, there will be backsliding, and it will be very difficult to get to that point. But given the distance that we have already come—when you think back to the period when Israelis and Palestinians wouldn’t talk to each other or recognize each other, and their sole desire was to obliterate each other—I believe that this last set of hurdles will be overcome. We are going to have to wait for the right psychological moment. Insight Video: Jerusalem: At Peace or in Pieces?